“Kashana” is a word from the Owambo language and translates as “wide open plain”. 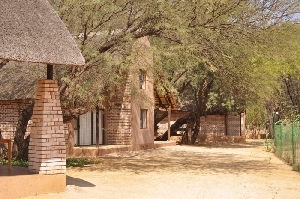 It appears that previous inhabitants had been inspired by the bush savannah that surrounds the country house in choosing this name: Kashana Country House. Built in 1907 during the German colonial rule, the main building originally served as a casino Kashana for mine workers. Over the years it was used for different purposes, but unfortunately it became ever more dilapidated. 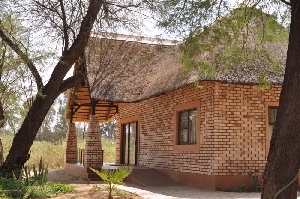 At Kashana you are accommodated in comfortable bungalows with every room offering either a king-size or two double beds. Family rooms (each with two double and two single beds) are also available. The bungalows all have air-conditioning, a soundproof fridge, a safe and a bidet in the bathroom. Of course television and Internet connection are part of the package. Revel in the silence of Africa, complemented by a view of the Omaruru riverbed and Erongo Mountains, whilst enjoying your sundowners on your bungalow's veranda. Although out in nature, you are still close enough to town to be able to sample its attractions such as meeting local artists and craftsmen. The little town offers attractive souvenir shops and restaurants and mingling with the locals will give you the opportunity to obtain a very personal impression of Namibia and its people. 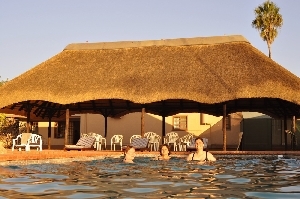 Kashana’s restaurant offers a delightful Namibian culinary experience for individuals and groups. You are welcome to join us for lunch, coffee or an exquisite dinner with the opportunity to sample our select wine list. Hosts also enjoy catering for functions, for which there are three different rooms to choose from as venues. The bar, which has been designed by Namibian artist Trevor Nott, is a highlight of Namibian interior design. 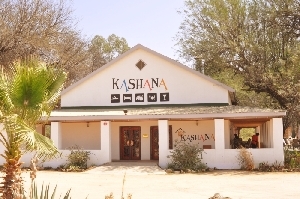 Kashana's Art and Craft Centre allows for the purchase of beautiful local arts and crafts and at the same time gives the visitor an opportunity to connect with Namibian craftsmen.